After a few weeks of deliberation, Cer Te (on 55th btw. 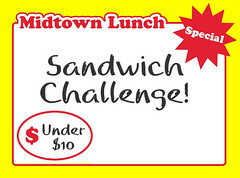 5+6th) has finally chosen the winner of this year’s Midtown Lunch Sandwich Challenge. You guys submitted over 200 entries, and apparently it was so difficult they (once again) decided on three different winners! They were chosen based on creativity, affordability (how much it would cost to make each sandwich) and most of all, the “cravings” of Midtown Lunchers- aka how excited us fatsos would get about it. Each sandwich will be featured as the sandwich of the month starting in May. MAY SANDWICH OF THE MONTH via Wayne S.
“Name to be Chosen” Buttered Texas Toast with Chicken Fried Steak, Cream Gravy, and a layer of fried Mac & Cheese. Each of the winners will be invited to Cer Te individually to meet with Chef Edward, who will tailor each sandwich to their liking until it is just perfect. Congrats to all the winners, who will each get a $100 gift certificate to Cer Te, and thanks to everyone who entered! Posted by Zach Brooks at 2:30 pm, April 14th, 2011 under Certe. Whoo hoo! Zach, put on your party dress and get on a plane… let’s go crazy Broadway style! OTOH, July looks like a winner! Maybe call it the Fried Chicken-Mac-Cheese Steak? Sad that I have to wait for July to try this! I’m ready for July right now! That sandwich is not bikini friendly. You will eat it anyway and like it! Stevenp- No ham and mayo? What do you get on a ham sandwich? I’m assuming you’ve never had ham salad before, I love that stuff. I’m excited to try them all. Good creations guys and gal.